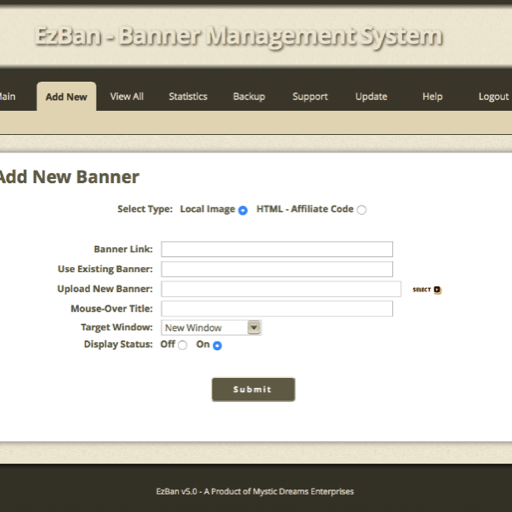 EzBan's Administration Interface is designed to help you manage your affiliate or local banner database and help you setup a clean, professional banner system in a few easy steps. No complicated instructions, templates for this and that, settings for this area and that area, no one understands and, well you get the point! Please be sure the demo version works on your server. You can then purchase the registered version for only $25.00. 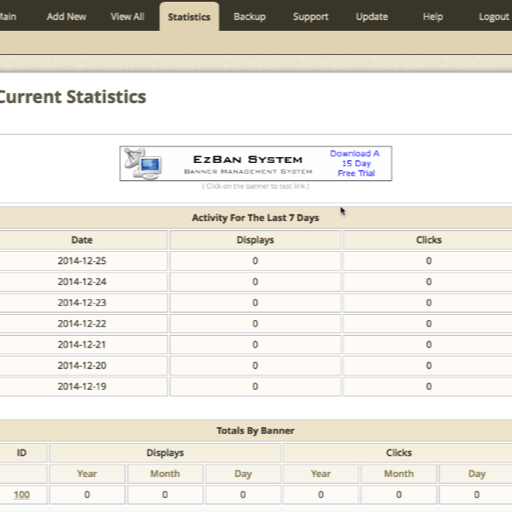 Above you will see the current version and release date for EzBan. These are listed to help you keep track of version and release date information. 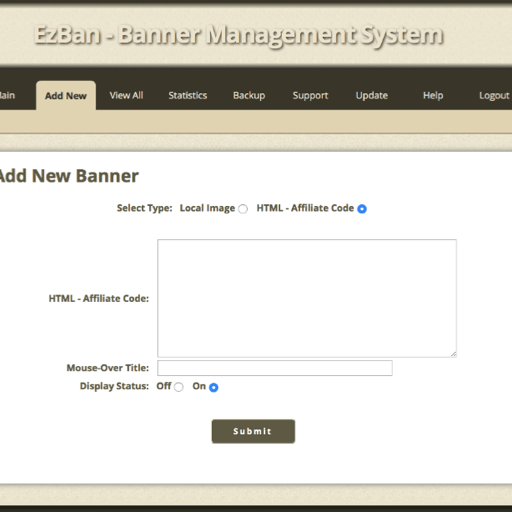 EzBan's Administration Interface is designed to help you manage your affiliate or local banner database and help you setup a clean, professional banner system in a few easy steps. To purchase the registered version of EzBan, please enter your full name, email address and domain name below then add to cart. You will need to enter your full name, email address and the domain name you will run EzBan on as the registered version is tied to a domain name. Please insure you provide a working, reliable email address to contact you and send your instructions to. You should have your registered download link and instructions normally within 24 hrs or less after purchase. Free providers like Hotmail or Yahoo frequently have problems and mail can not be sent or received making it harder due to spam filters and more time consuming to send your registered version. WE PROVIDE RESULTS UNMATCHED IN THE INDUSTRY! We provide services that encompass all aspects of internet protocol, web site development and maintenance, programming, e-commerce, secure services and certificates, computer services, software, hardware and true virtual hosting providing you with a dedicated server experience without the technical knowledge or expenses of a dedicated server. 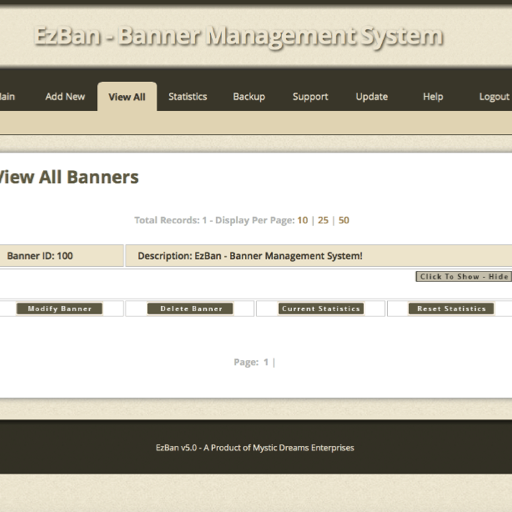 A completely self-contained banner rotation system - SSI and PHP include. EzBan runs in two modes: static and timed auto-rotation using iframe. A built in upload or use existing banner image feature. Use local banners or HTML affiliate codes from ShareIt and eSellerate with ease! Can be used on limited MySQL systems where only one database is allowed by your provider. As well as multi-installs under the same MySQL database. 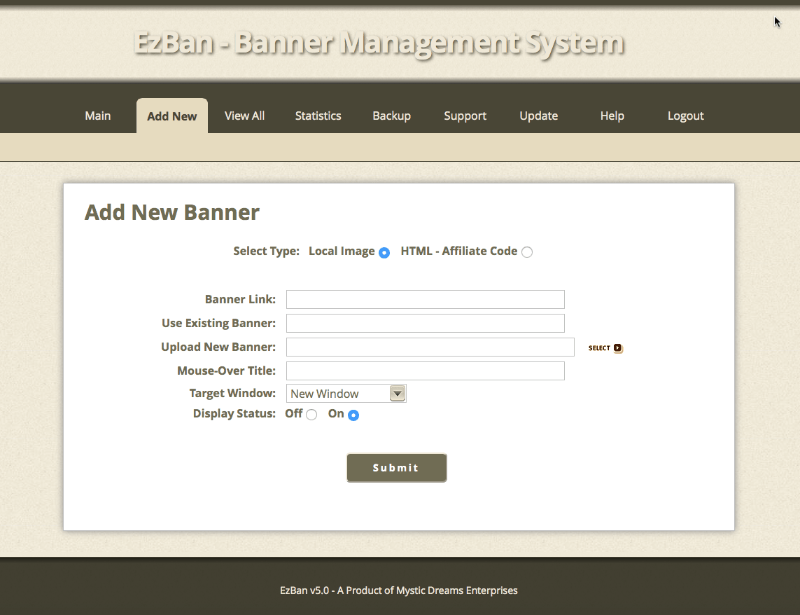 Use of borders and border colors for banners can be set, including the iframe. Set valid HTML 4.01 or XHTML/XML Output feature. Set language and character set feature. Set a color theme to your taste. 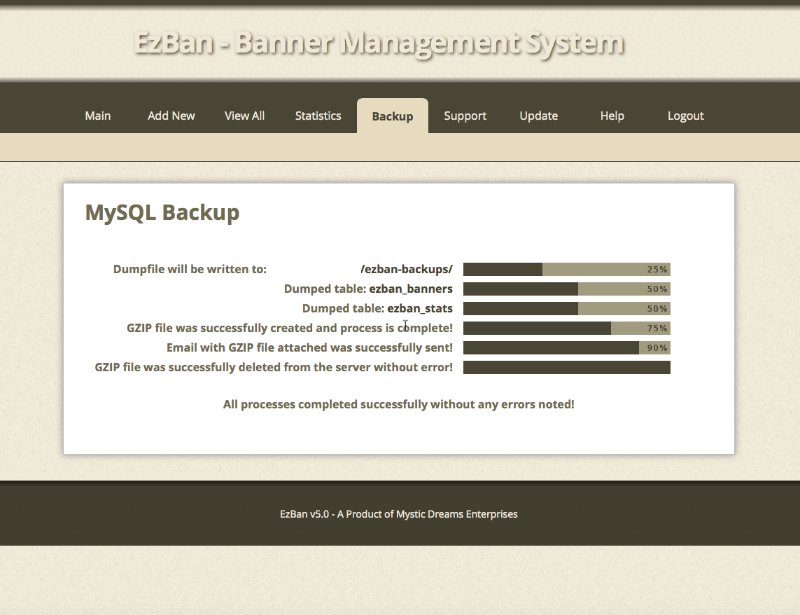 Built in MySQL Backup feature. 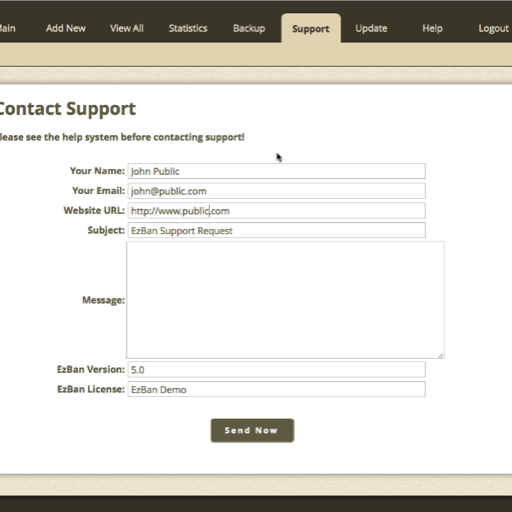 Built in Support Request feature. 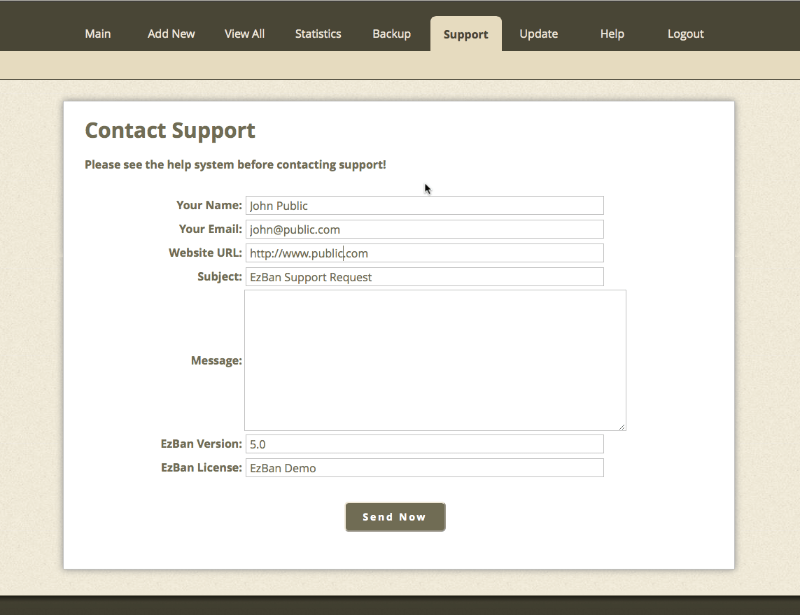 Built in Online Help feature. 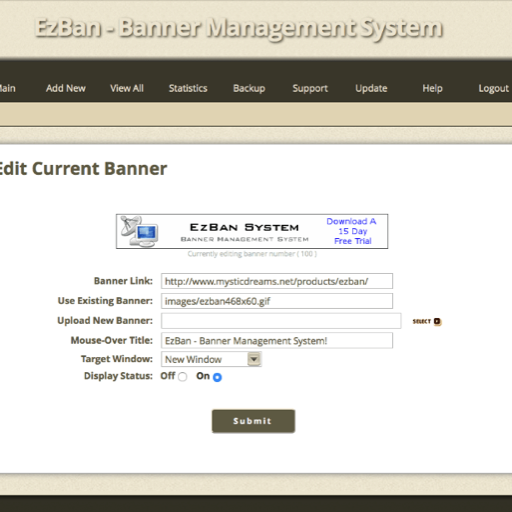 Edit the config.php and ezban.php, then upload all files to your server. Import the MySQL file to your MySQL server. Set chmod 777/755 on a folder. 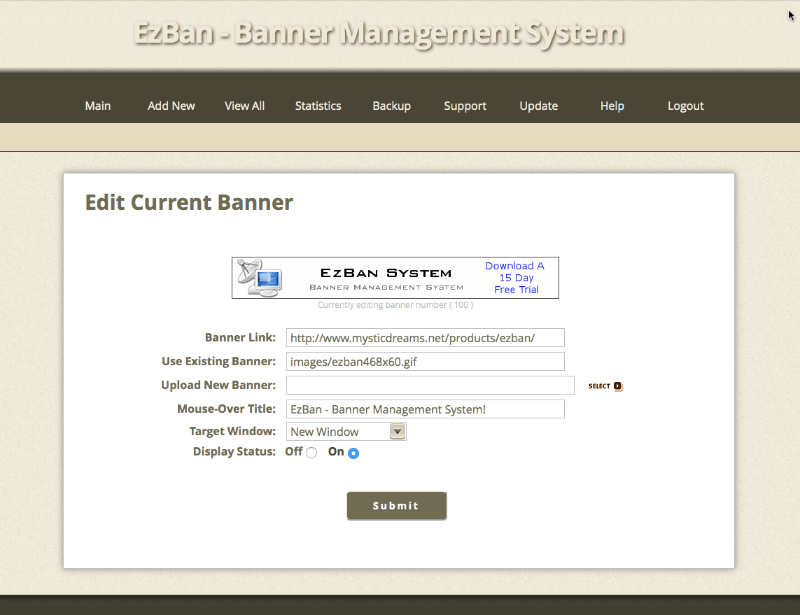 Login to the Admin Area and begin using EzBan! 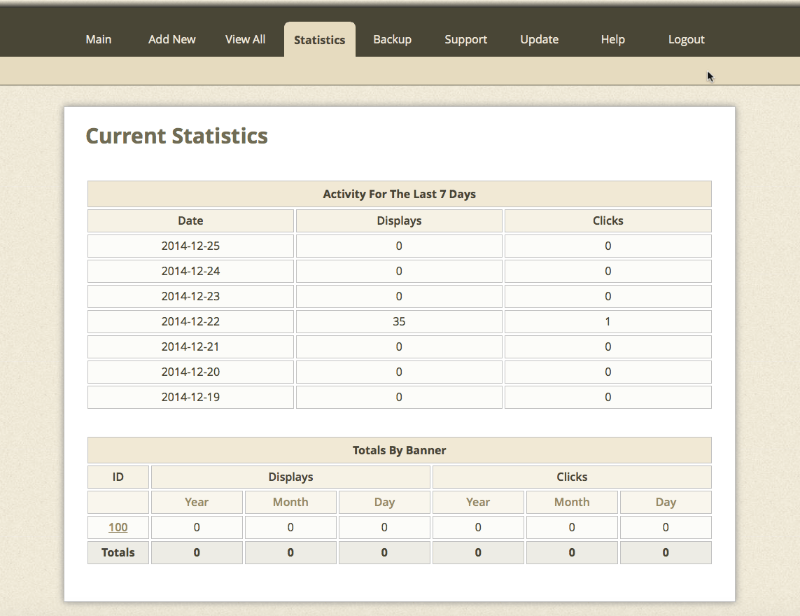 Built in admin login / logout process. Ability to Add, Edit, Delete banners. 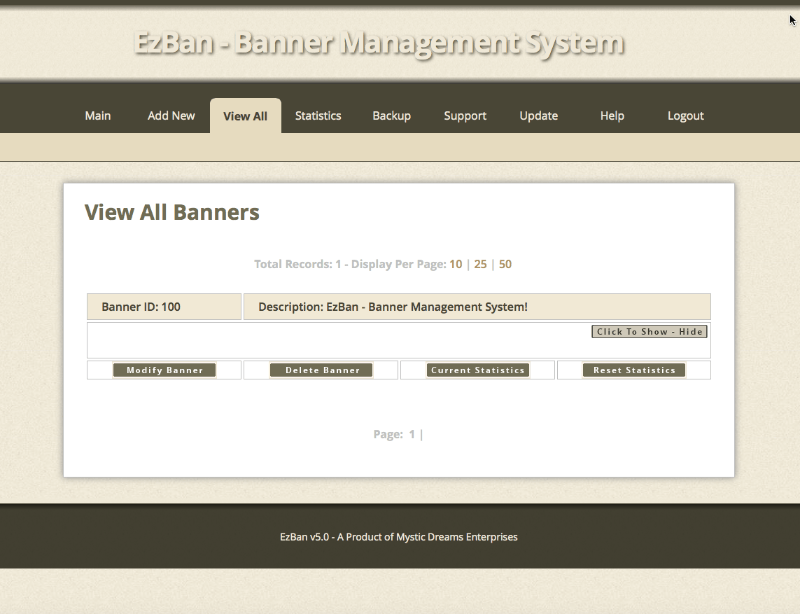 Built in pagination to list your banners. 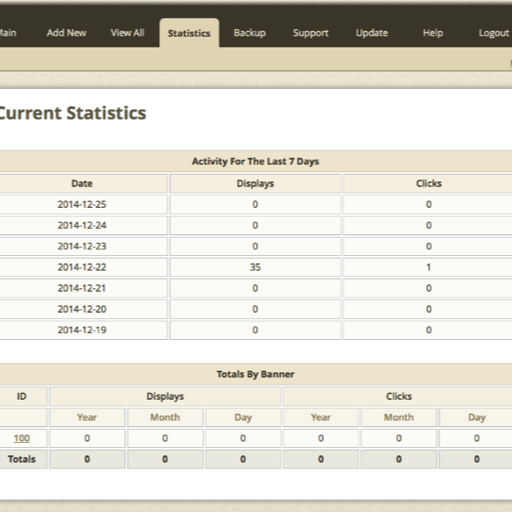 Built in statistics function to see how your banners are performing. 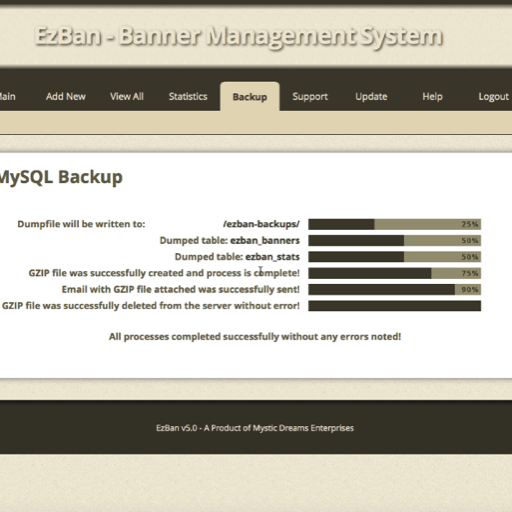 Built in MySQL Backup function that creates a ZIP archive of your complete database. 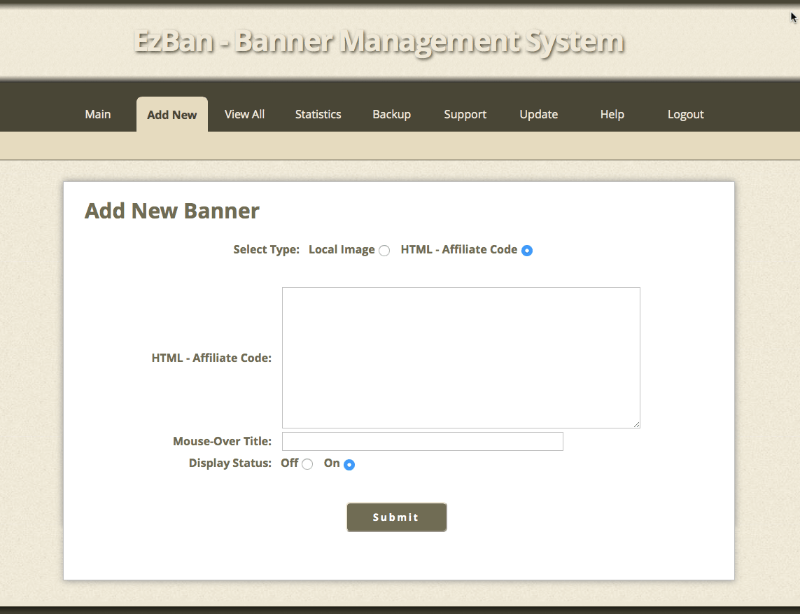 Use ANY banner affiliate code or use Local Banner Images! ie: ShareIt, RegNow. 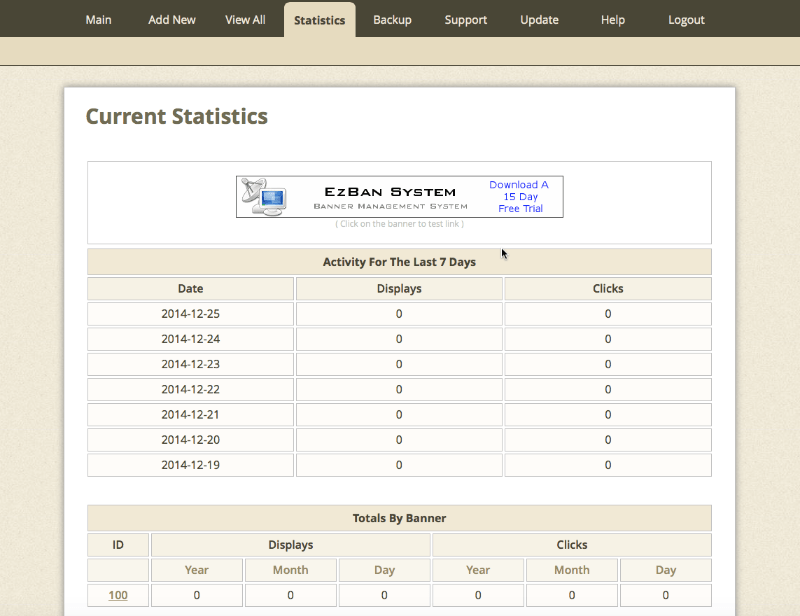 Ability to add EzBan tables to an existing database. Multiple installs on the same domain. A simple, easy to use banner rotation system! Below is a screenshot demonstration of EzBan to give you a visual idea of what EzBan looks like and the basics of how it functions. An active demo is not possible due to abuse, please download the fully functional trial version to test EzBan on your server.